We Need To Talk About Revolution Pro – A Recent Beauty Haul.. I, like every other beauty blogger in the entire world, was super excited when Revolution Pro was first released. Although not my absolute favourite brand, Revolution has always been a brand I’ve loved and I couldn’t wait to get my hands on at least some of their new releases. I’m a drugstore gal through and through, I love a good beauty bargain, and this entire range is exactly that, with the majority coming in under £10, with quality that tends to be just as good, if not better, than most high-end products I’ve tried.. I read review after review, watched video after video, before finally getting my hands on some of the range to try myself. I was torn between so many items that it took me quite a while to fully decide on what it was I needed. In the end, I picked up the Full Coverage Camouflage Foundation in F2, the Translucent Pressed Powder and the Brow Pomade in Dark Brown, all from Superdrug, which with my discount came to £15.30..
I’ve talked about it countless times throughout my blog but in case you’re new here, I have oily skin, and I will always be a matte, full coverage gal. I remember watching the promotional video for this foundation before the range was released, where it’s shown to cover tattoos and scarring, and I got a little too excited, thinking that this was going to be my new Holy Grail. When I first used it, I was expecting it to hide my uneven skin tone, all of my blemishes as well as my deepest, darkest secrets and I must admit, I was just a little disappointed. I was a little uncertain on my shade in store and swatched five or six different colours, because I tend to normally be the lightest shade, but I ended up opting for F2. Thankfully, it was a perfect match, matching me better than most other foundations in my makeup collection and I love just how vast the shade range is, unlike most other drugstore brands who tend to just cater for guys and girls that are super light skinned. The coverage is great, don’t get me wrong, but it isn’t the most full coverage foundation that I’ve ever tried and I still had to build it up on areas like my nose where foundations commonly seem to slip or struggle to stick. However, I did find that when I had finished my base, my skin looked flawless, more flawless than it had looked recently, which I loved. One of my favourite things about this foundation is that when my natural oils started to come through, the foundation didn’t separate in the way that most foundations do, I instead looked glowy and as an oily gal, I would much rather look naturally glowy than have a patchy base, which definitely isn’t a look. I think that this foundation is going to be a staple in my collection, especially for £7..
Debra-Bow is solely responsible for making me purchase the Translucent Pressed Powder. I read her first impressions post a day or two before I headed into my local store, where she rated the Pressed Powder a 10/10, and I knew I needed to try it myself. I think it’s safe to say, my hopes were set ridiculously high after reading that post! I normally use loose powder and have done for a few years now. I swear by the RCMA No Colour Powder but I always have a Rimmel Stay Matte Pressed Powder in my handbag for touch-ups throughout the day, because it’s every girl’s essential. I prefer pressed powders for ease of application, but loose powders give me the matte-ness that I want and need, so finding a pressed powder that gives my makeup a super matte finish is the stuff of dreams in my mind. The first thing I noticed when using this product is the kick-back the powder gives, and for reference, I apply powder with a big, fluffy brush, either a Real Techniques PowderBleu B01 or a Spectrum Collections A01. Having tapped the brush into the powder a couple times, I found that the packaging was covered in the product almost instantly. This isn’t a game changer, but I guess it does make me concerned that the product may run out more quickly and it makes me think that the powder may be quite soft, which isn’t ideal for travelling. Applying the product to my face was easy and left my base matte, which is exactly what I wanted, and I remained mostly oil-free without touching up for hours after it was applied. In all honestly, I was torn since their release between the Brow Pomade and the Brow Cushion. I love a good pomade, but I’ve previously purchased the Freedom Pomade which I assumed to be the same formula, which I found to be too dry and hated. I was also intrigued to see whether the Brow Cushion was anything like the one from Iconic London that everyone raved about for a hot minute, but was a little out of my budget. I ended up opting for the Brow Pomade, in the hope that it could compete against my all-time favourite product, the Elf Brow Gel. I first noticed that the pomade was much softer and easier to ‘get onto the brush’ than I expected. Pomades can be super hard and difficult to apply, so I was excited by this product when I realised it wasn’t rock solid. However, getting the product from the brush onto my face was much more difficult. I have very sparse brows, and found that the pomade applied fairly easily to areas where there was hair, but in areas that had very few if any hairs at all, I struggled to get solid colour payoff. I persevered with the product and managed to create my brows in the way I normally do, but the struggle meant that it took much longer than normal. I think this would work well for someone who simply ‘fills in their existing brows’ but for any girls who, like me, have very gappy or non-existent natural brows, this may not be the product for you. I didn’t have very high hopes, and will be quickly returning to my staple Elf Brow Gel which also retails for £5..
As always with any beauty haul, no matter how big or small, you’re almost bound to have some hits and some misses, and I reckon my haul, especially for the prices paid, was pretty successful. 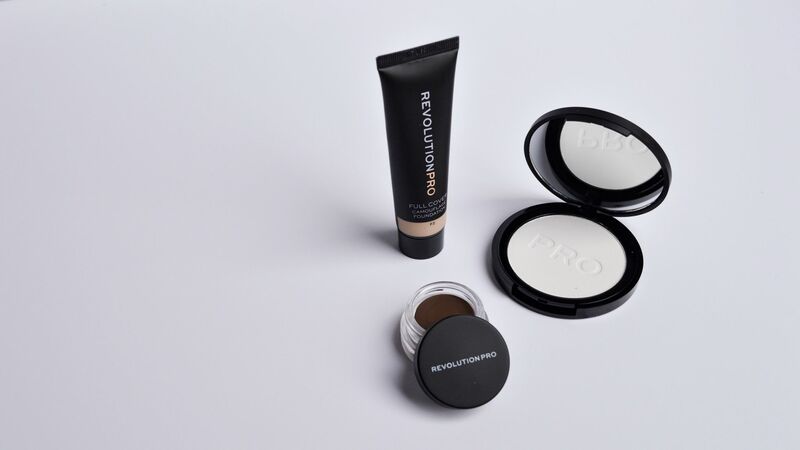 I’m excited to try out some of their other products – the Revolution Pro Full Coverage Camouflage Concealer, the Revolution Pro Eyebrow Definer Cushion mentioned earlier, and the Revolution Pro Regeneration Palette – to name but a few that are on my list..
Have you tried anything from Revolution Pro? What’s your best, most recent makeup discovery? Affiliate links may be used throughout. "Netflix Series’ That I’m Living For At The Moment.."